What Website Usage Reports Does Google Analytics Provide? All InvestorPro.com websites now have the power of Google Analytics. 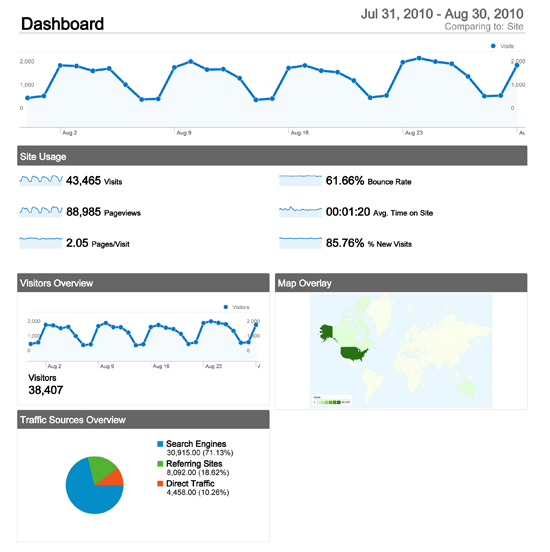 Google Analytics delivers valuable website usage information with a very user friendly display. Find out how many people visited your site for the first time, how long they stayed, and how many of them returned. Track where the users visiting your site came from, search engines, external links, or direct address. See what keywords and phrases are being used most when customers find your site through search engines. Find out what countries are producing the most traffic for you and your site. This is a great resource for international businesses. To learn more about Google Analytics and how it can help you, watch the Google Analytics Product Tour. Ready to add Google Analytics to your Real Estate Investor Website? All we need is your GMail address and we will take care of the rest.